The CLA today enthusiastically welcomed the Government's decision to create the Groceries Code Adjudicator (GCA) to monitor and enforce the Groceries Supply Code of Practice. 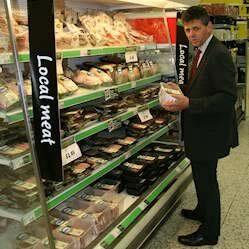 The move follows years of lobbying by the CLA – along with many other groups representing suppliers, and campaigners such as Andrew George MP - for an independent ombudsman to protect the interests of food and drink suppliers in their relations with the big retailers. CLA President William Worsley said: "The far-sighted decision by the Coalition Government to appoint a Groceries Code Adjudicator could be just the boost the food industry needs. "The power of the supermarkets has long hampered many suppliers whose profit margins have been squeezed to the point of making their businesses unviable. "Such abuses of power ultimately harm people throughout the food chain, from the producer and the supplier, through to the consumer." Mr Worsley added: "The CLA particularly welcomes the announcement that the GCA will be able to deal anonymously with complaints of breaches of the Groceries Supply Code of Practice. "Previously, suppliers were put off making complaints because of the 'fear factor' of big retailers shunning them in future. At last, such practices can come to an end." Which Way Will the Genetic Beef Market Wind Really Blow?